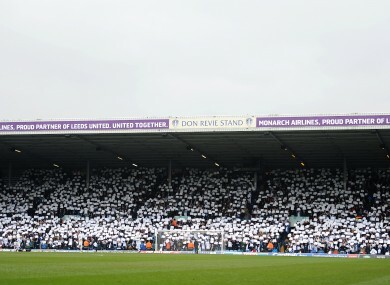 Elland Road, the home of Leeds United. ITALIAN BUSINESSMAN MASSIMO Cellino has been barred from taking over fallen giants Leeds United. The English Football League said Cellino’s recent conviction for a tax offence in an Italian court was a “disqualifying condition under its owners’ and directors’ test”. However, the ruling by the Football League, the governing body for the three English divisions below the elite Premier League, leaves second-tier Leeds facing an uncertain future given Cellino has already put more than £2 million ($3.3m, 2.4m euros) into the Yorkshire club. The league said the decision was taken at a meeting of their board on Sunday following Cellino’s fine for non-payment of Italian duty on a boat imported from the United States. “Mr Cellino was recently found guilty beyond reasonable doubt by a Court in Sardinia of an offence under Italian tax legislation relating to the non-payment of import duties on a boat,” said a Football League statement issued Monday. “This resulted in a fine of 600,000 euros (£500,800), an order for the payment of trial costs and the confiscation of the boat in question. “Having fully considered the matter, the board agreed unanimously that the decision of the Italian court does constitute a disqualifying condition under its owners’ and directors’ test. Cellino is entitled to appeal against the league’s decision within 14 days. Last Tuesday, following Cellino’s conviction by an Italian court, his lawyer said the verdict was “irrelevant” as far as the takeover was concerned. “According to my point of view, this business has no relevance whatsoever to the decision of the Football League,” Giovanni Cocco told BBC Radio Leeds. Cellino, the president of Serie A side Cagliari, already had a 2001 conviction for false accounting and is being investigated for alleged misuse of public funds relating to construction work on Cagliari’s Quartu Sant’Elena stadium. Leeds, one of England’s leading clubs in the early 1970s, are currently 13th in the second tier Championship and a huge 29 points adrift of automatic promotion to the Premier League. In January this year, it was reported Cellino — still to complete the takeover but having agreed a deal with GFH to purchase 75 percent of the club’s shares — had sacked Leeds manager Brian McDermott only for United to confirm days later that McDermott remained in post. Email “English football league bar businessman Cellino from taking over Leeds United”. Feedback on “English football league bar businessman Cellino from taking over Leeds United”.